Just click here for the tutorial from a little while ago. These Twins Are Just Too Cute! Cute! I love it! Where do you get your ribbon from? Oh my Conner is becoming a monster. I can’t believe he fits into those pants that Q just grew out of! Wowzers (that is a word too)! I need him to come visit so I can squeeze his chub! I LOVE IT!!! 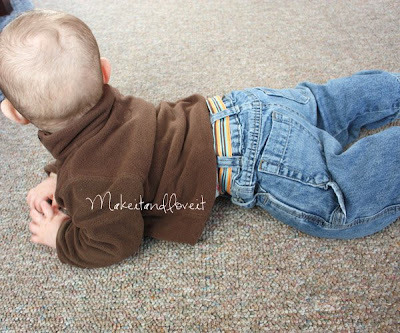 i saw this tut a while ago and never thought about making one for my little boy! and does he ever need a belt! this boy cant keep pants on! Diane, I got that ribbon from Wal-Mart. I know Cori……where’d my newborn go?? Good Laura, I’m glad this is something you’ll use!!!! I’m one of your followers. You totally read my mind. 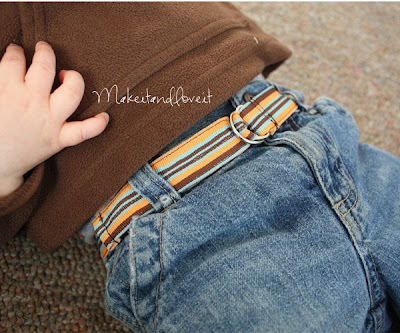 I’ve been wanting to make some belts for my 2 year old little guy. I don’t have boy-ish ribbon though, so I am scraping together some fabrics then double siding it (maybe it will be reversible….if I have time). I love these belts! I made one for my daughter and her pants finally stay on! Is there a certain kind of ribbon you get? The one I got seems to get scrunched all the way around. Thanks for the tutorial! 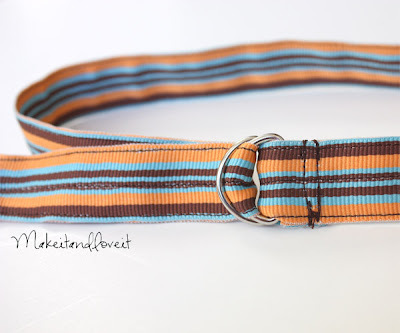 Chalece – I used a grosgrain ribbon for my little girl’s belt and this little boy one is like a woven ribbon of some sort. It’s almost like canvas…….I think. I’m not sure what else to call it. But it’s rougher than grosgrain. Does that help. Team Chilton – How funny that you were about to do this too. Fabric would be darling. Let me know how it turns out. I just made a belt using the same ribbon but somehow I started getting single loops of loose thread in the seams. is it the tension or am I sewing too fast. My seams don't look pretty/neat like yours. Lynn, yes it sounds like a tension issue. Adjust your knobs and use some scratch fabric to test out all of the settings. Good luck and try it again! !